What songs should you start with? Playing the guitar can be such a rewarding experience. Exploring your personality through this instrument will not only help you use your brain differently but will also enable your creativity to take countless sonic shapes. However, as a beginner, even some of the easiest songs can prove to be quite a challenge. Still, it doesn’t have to be so. Your encounter with this instrument should challenge you indeed but it should do it in a pleasant and not in a frustrating way. The trick is to find songs that are easy but not boring. Even if beginner songs should be simple, it doesn’t mean they shouldn’t tickle your inspiration. 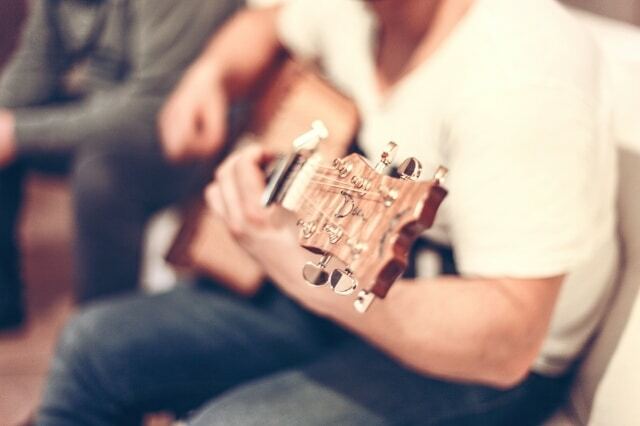 There are many great songs for both electric and acoustic guitars. We’re here to help you find one or more. The many easy guitar songs might intimidate you as a beginner. And with so many online guitar resources including videos and written materials, setting a starting point might not be free of disorientation. The confusion might be further deepened by the song categories you will find. Thus, you will have to ask yourself whether you want to give chord or tab songs a try. Most guitar teachers and players recommend chord songs if you are a complete beginner and move on to tab songs once you’ve mastered the basics. To help you expand your song vocabulary, we have compiled a short list of beginner songs that are easy yet fun and interesting to play. Some of them might still feel difficult at first, but they are actually easier to play than they sound. Before attempting to play your first songs, you need to know the basic guitar chords for beginners and thanks to today’s online courses you can easily take that first step. Check out our Learn How to Play the Guitar Using These Online Guitar Courses for the most appreciated websites that can help you with that. Some of them will provide you not only with tips and important information on how to get a song right but with a rich library of songs as well. The lists of easy guitar songs are extensive and that might be another bump in your road to sonic heaven. Your personal preferences will help you filter such lists of options. However, since our readers have different preferences, we have included songs that will, hopefully, satisfy the needs of each and every reader landing on our page. One of the easiest songs you can try is Bruce Springsteen’s “Born in the USA”. The all-time rock classic can be played with just two chords. You can go for A and D, E and A, or G and C based on which ones you know better and where you want the capo to be. Many guitar song lists for beginners include the now classic “Wish you were here” by Pink Floyd. With an excellent intro, the song is not only sonically pleasing but also fun to play, although a bit difficult at first. As a beginner, you might want to start with the verse and chorus strumming parts as they are easier than the rest of the song. It does require good rhythm skills and pick accuracy but it is surely rewarding once you get the timing right. In case you’re interested in working on your barre chords, a nice song you might want to try is “Layla” by Eric Clapton. The song won’t just help you with that but will make practice be all about fun as it is easy to play. The same can be said about the artist’s “Wonderful tonight” as long as you ignore the lead work. Once you do so, all you need to master is G, C, D, and Em. A popular among beginners is also “Hotel California” by The Eagles. What makes it part of the most preferred songs by novices is the fact that, even if the chord progression is lengthy, it is easy. If you’re into this band, you can also try their “Take it easy”. It’s true that the intro might be a bit confusing at first, otherwise, the song is pretty easy to play. Another song that is great if you want to start learning basic chords (D, A, and G) and how to easily switch between them is “Bad Moon Rising” by Creedence Clearwater Revival. The song’s steady strumming is ideal for anyone still trying to figure out the basics of this instrument. Many novices also start their journey with the classic “Walk of life” by Dire Straits. The web offers versions of this song that were specifically simplified for beginners. If you feel audacious, you can even start with Metallica’s “Nothing else matters”. The song can be actually easy to play. You can either play it as a novice’s open-chord strummy thing or you can learn every solo and fingerstyle part so you can do it for real. Other songs that are recommended for beginners include “Love me do” and “Eleanor Rigby” by The Beatles, “My Best Friend’s Girl” by The Cars, and “Tush” by ZZ Top, just to name a few. 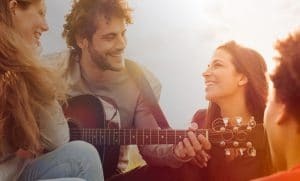 Identifying the right beginner guitar song for you should, after all, be a personalized experience. While we could extend our list and add hundreds of other titles, we think that you could use the ones mentioned above as a reference. 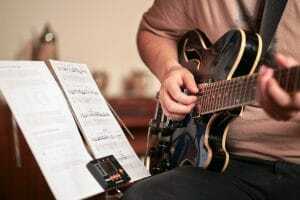 What you’ve learned so far, the genre you feel connected with, and the condition of the acoustic electric guitar you use are a few factors that will help you create your own playlist. Sometimes, you might be using the best sounding acoustic guitar and still feel like it does not provide you with the sonic ecstasy you want because of a song mischoice. Yes, a song counts that much. If you still have doubts regarding your first songs, ask a professional to help you with that after an assessment of your skill and musical inclination.